There is a new tour of Judy - the Judy Garland Story: The Life and Music of a Legend which features the life and music of Judy Garland_ the highs and the lows: good times and bad next summer starting in May at Edinburgh Playhouse. Casting is yet to be announced but her classic songs will be performed by award-winning singers and dancers, who recreate film scenes from her golden Technicolor years at MGM, her legendary concert performances, including New York’s Palace Theatre and the London Palladium. 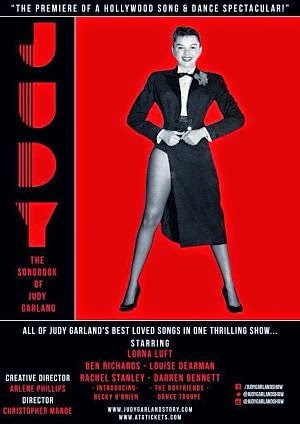 The special guest for the evening will be Judy Garland's daughter, Lorna Luft.